Provide clear communication about the cost and type of repairs needed for your vehicle. Our goal is to repair your vehicle for longevity of service and cost effectiveness. If the additional money or repairs exceeds the fair market value of the vehicle, we will recommend against repairing the vehicle. Answer all your questions regarding the repairs we are providing so that you have a clear understanding. Respect your intelligence, help you to make informed decisions, offer you flexibility in scheduling and give you timely feedback. Provide outstanding ASE certified technicians who exceed industry standards of 36 hours of classroom training. Our technicians average between 90-110 hours training each year. Provide a comfortable and friendly environment. We really do care about your experience with us and will do everything we can to convey that to you. Provide transportation to work, home, or wherever you desire. We also work with local rental car agencies so that we can access rental cars for you at very competitive rates. Provide a comfortable waiting area with outside telephone access, VCR, various publications and whatever we can do to make your stay with us more comfortable. Give you a no charge subscription to Giammalvo Quarterly-our newsletter written entirely by our staff giving you the latest insight into our complex industry. Provide a twelve month/twelve thousand miles no questions warranty on certain new parts and labor. (Feel free to ask Glenn or Mark about the details of our warranty). Offer you our Warranty History Service which allows us to research the warranty status of your vehicle to determine what, if any, warranty is remaining on your automobile and for how long. This is crucial to know in order to avoid paying for the replacement of covered parts. In addition, the warranties will usually be multi-level, with some emission parts having coverage through eight years and 80,000 miles. Most automobile warranties are intimidating to read & comprehend. Our staff will read through the legal terminology & make sure your vehicle manufacturer pays for covered repairs. Select customers who will partner with us, share a mutual respect and are seeking quality car care on a long term basis. 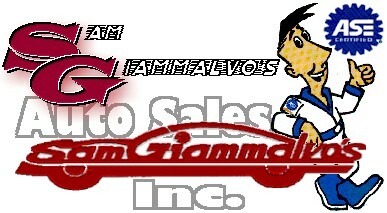 Sam Giammalvo's Auto Sales & Service is family owned and has been in operation since 1961. We have an outstanding reputation in our industry and occasionally are consultants to governmental agencies as well as media consumer awareness programs. In addition, Glenn & Mark Giammalvo are contributing writers to the national publication: Motor Age Magazine. Sam Giammalvo's Auto Sales & Service Inc. is an active member of the Automotive Service Professionals both locally and nationally. Members agree to the highest honest and ethical business practices.